Home / blog / Why Wellness Tourism has become a trend nowadays? Why Wellness Tourism has become a trend nowadays? Amid the socio-economic and techno-political drama surrounding our lives, we have quite forgotten what ‘quality of life’ actually means. In our everyday life, we accomplish many things and achieve a fortune but we sacrifice our wellness for it. Before the time of Industrial revolution and IT revolution, people lived a healthier and more peaceful life. And Wellness Tourism is one of the ways to experience that ‘quality of life’ once again. 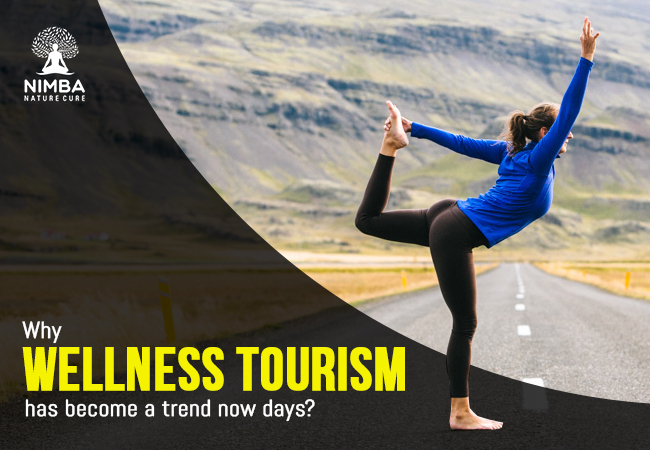 Wellness tourism is different from medical tourism, mainly because in medical tourism, the patients seek an apt solution for their current disease condition while in wellness tourism; people seek to improve their overall health. There are so many benefits of wellness tourism which is why it has become a trend nowadays. A wellness vacation comprises of so many interesting activities and therapies such as organic living, massage, spa, meditation, diet therapy, etc. Wellness tourism gives the much-needed opportunity to a person to relax, have fun, and improve overall health. The experts in wellness retreats such as Nimba Nature Cure Village, advises the guests about healthy lifestyle habits and dietary choices which the guests can follow even after their wellness vacation is over. Compared to a sightseeing holiday, a wellness holiday creates greater value. Most of the wellness retreats are situated in India and nearby southeast Asian countries which are very much cost effective compared to the US, Europe, and Australia. Also, some of the world’s ancient wellness practices such as Acupuncture, Raaga therapy, Panchkarma, and Cupping therapy have originated from specific regions. People can experience an advanced level of expertise and knowledge of those countries with wellness tourism. Wellness tourism gives people a sense of achievement and accomplishment, which is absent in regular holidays. It works profound changes in the way you live and it establishes the foundation for a healthier future. No wonder, wellness tourism is the second biggest segment of tourism after cultural tourism with almost $450 billion markets worldwide. It is a trend which is here to stay for a long time. And looking at the current pace of the technology advancements, more and more people are going to need a wellness vacation to rejuvenate their body.